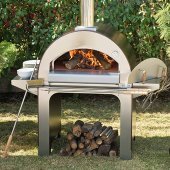 The Alfa Ciao pizza oven is strong, light and quick. Thanks to the wheels and its light weight, Ciao can be moved easily to the garden, terrace or wherever you wish. 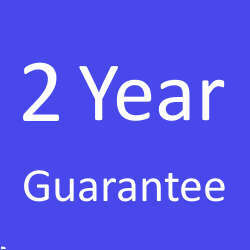 Two pizzas 25cm in diameter can be cooked in 90 seconds. To facilitate movement, the legs can be removed in a few minutes. This oven really get peoples imaginations going. 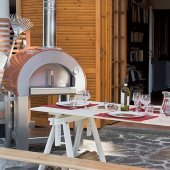 The Alfa Ciao pizza oven is a brilliant tool for inspiring good times around the table. This is the oven to have for the ultimate foodie. The oven floor is made of 3 interchangeable refractory tiles, each 3 cm thick, designed to store heat and convey it to food for cooking. 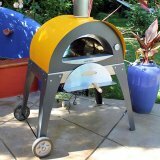 The oven cooks 2 pizzas (25 cm diameter each) in 90 seconds, and 2 kg of bread with every oven load. 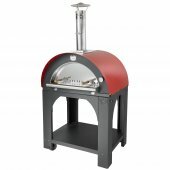 The stainless steel dome of the oven is studied to reach high temperatures while consuming very little wood. 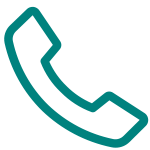 Ciao is delivered to your home almost ready for use. Complete the oven by merely inserting the flue and assembling legs and castors with a few screws. 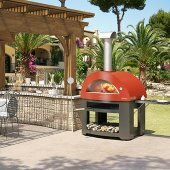 Your pizza oven should ideally be sited in a dry well ventilated environment, with a gap of at least 50mm between the back and sides of the unit and adjacent walls or other appliances. 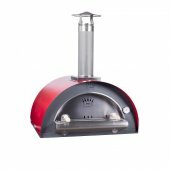 The base of your pizza oven will become hot and therefore should not be placed directly onto wooden or formica surfaces also a gap of 25mm should be kept between the unit and the surface on which it is situated. 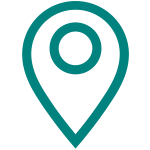 The height of the unit can be set by adjusting the screw feet. Please be aware that all pizza ovens, supplied online and in store, when lit are hot to touch and will burn. Please take care with your pizza oven and always ensure a pizza peel is used when removing food. When opening any stove door and adding logs it is also advised that a set of fire proof gloves are recommended.